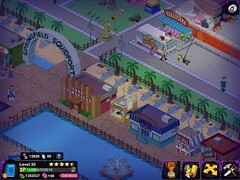 Thanks creators of The Simpsons for making this easy by placing both of the new in-game items together in one frame. In case you missed the season premiere, below is a screenshot from the episode. It features the Hi-Glow Waste Barrels and Three-Eyed Sushi, items that are only available to acquire for one more day. Once the Treehouse of Horror update rolls-out on Tuesday, you can be sure your chance to grab these items will have passed. The Three-Eyed Sushi restaurant cannot be purchased, it must be earned by completing the “Conventional Wisdom” quest that triggered on Thursday. If you haven’t completed this quest line yet, make sure you finish it up today. The only characters you need free for this quest line are Homer and Lisa, so if you’ve got them running other tasks, finish them and get to work on this one before time is up. This building won’t be available for much longer. As for the Hi-Glow Waste Barrels, if you’re still undecided as to whether or not to purchase them for 40 donuts, below I’ve posted a screenshot of what they look like in-game alongside a piece of debris, as well as the Three-Eyed Sushi restaurant for size comparison.